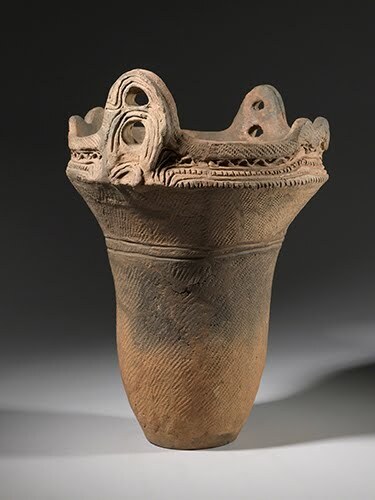 The Jomon culture of Japan had a long history (active by 11,000 BCE, flourished 3000s–200s BCE) and produced tons of gorgeous ceramics. Kako Katsumi is inspired by the ceramics of that culture (and others, in my opinion), putting an elegant, clean, sophisticated, and modern spin on the ancient aesthetic. You can probably see the color aesthetic that Katsumi used in his vessels of the early 2010s in comparison to the Jomon vessel. It has the same earth-tone simplicity as the Jomon, with a contemporary form. Katsumi’s work calls forth reflection on even older prehistoric art work such as simple cave paintings and patterns in a red ochre color. Katsumi is a third-generation ceramic artist born in Kyoto. He learned the traditional styles from the major kilns in Kyoto, mostly very decorative. 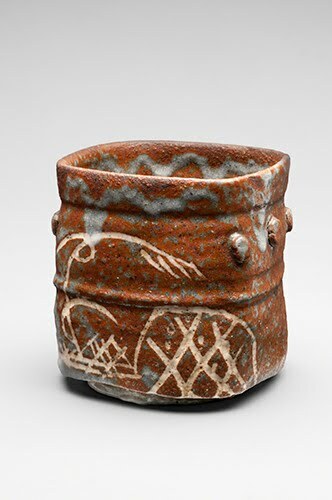 If his work reflects the influences of any of those kilns, it would be that of the Tamba/Tachikui yaki ware of Sasayama in Hyogo Prefecture, west of Kyoto. He moved from Kyoto to that region so that he could experiment with more individual creativity. 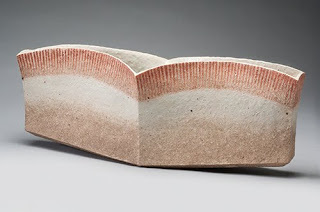 The artist worked initially with an electric kiln, later turning to a wood burning kiln that helps give his pieces an earth-red hue that fades into a sandy coloration. He became renowned for his interpretation of tea bowls (“chawan”), which are of utmost importance in the tea ceremony. He currently is also producing larger scale ceramic works in sculpture. Take a look at his gallery on his website: www.kakokatsumi.com/home/gallery-1/. Now tell me if his work doesn’t resemble this example from the Momoyama Period? “Argentinian Modernism” is not really a term bandied around at any length in surveys of modernism of the mid- to late 1900s. The truth is, the development of modernist art movements in Central and South America is sadly neglected in the US and Europe, despite the fact that European and American modernist movements had great impact on South American modernism! In Argentina, during the time political liberties were increasing from the late 1910s into the 1940s, most modernist art was influenced by European artists such as Expressionists, Surrealists, and Fantasy artists like Paul Klee (1879–1940). After World War II (1939–1945), a growing number of Argentinian artists studied not only in Paris, but also in New York, where Abstract Expressionism was just taking off. The 1946 “White Manifesto” written by a number of Argentinian artists argued for the supremacy of nonobjective abstraction. From that period on, Argentinian modernists participated in every avant-garde movement in Western art. Born in Buenos Aires, Rogelio Polesello studied at the Prilidiano Pueyrredón National School of Fine Arts in Buenos Aires, graduating in 1959 in print, drawing, and illustration. From a young age, he worked in graphic design, which led him to experiment freely with the modernist styles of the time. At the age of 22, he had his first solo painting exhibition at the Pan American Union in Washington, DC. 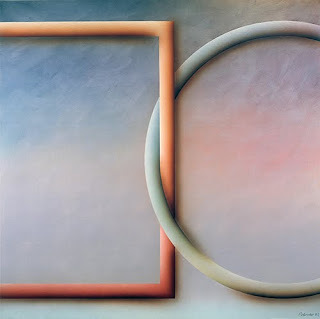 His early work reflected the influence of Constructivism, a European (Russian derivation) style that emphasized the purity of geometric abstract forms. From this geometric simplicity, the next step was the optical movement that repeated geometric forms could engender in the Op Art Style. Evidence of his brilliant fluidity with modernist styles is how, though influenced by Op Art, he did not stick with one approach. He painted in both hard-edge forms, like Painting below, and in painterly chromatic variations, like Fragments. The breadth of his experimentation with Op Art reminds me of Herbert Bayer (1900–1985), a Bauhaus artist who was also initially a graphic designer, and who also did many interpretations of Op Art. Therefore, it is difficult to pin down Polesello as solely an Op Artist. He flirted with Hard Edge, Concrete Art, and Neo-Illusionism, as well. He was not solely a painter, creating works in sculpture, interior design, textile design, and architecture. Here’s an earlier and a later Polesello from the one above: Fragments seems like a transition between the hard-edge Op Art style and the Neo-Illusionism of the later work. 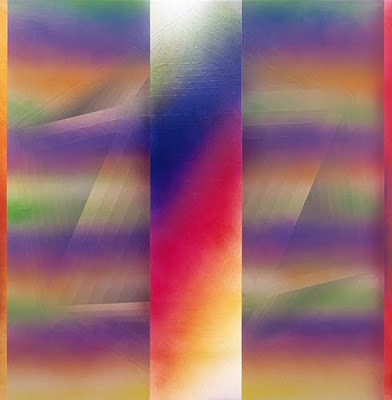 He’s combined the geometric forms of Painting with the nuanced fields of color of Fragments. It’s been really cold here recently, relatively speaking for New England. How do you turn something New Englanders consider a negative into a positive? Focus on cool colors in works of art. Color is one of the elements of art, and what better way to kick the winter blues than to look at cool colors that have nothing to do with the weather? I am a great admirer of Alma Woodsey Thomas, about whom I’ve blogged before. She was the first graduate of the Howard University fine arts program, and for thirty-five years she taught art in the public schools of Washington, DC. After painting in a realistic style while teaching, she began to explore color field painting in the late 1950s while studying painting at American University. Her interest in pure, unmodulated color was influenced by the then-prevalent Abstract Expressionism style. Thomas developed her signature mosaic-style of nature painting in the mid-1960s, ultimately replacing her color field style. 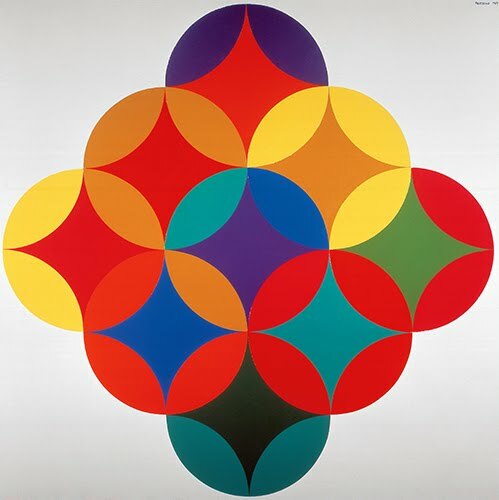 However, this work from 1974 is reminiscent of her color field works. It almost reminds me of a color interpretation of rain falling. 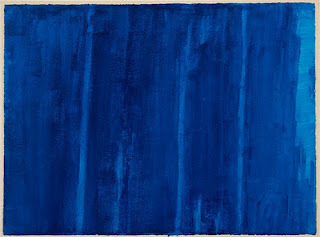 At any rate, the cobalt blue is a beautiful, abstract statement. Lalique was apprenticed to a jeweler in Paris at the age of sixteen. His mentor, Louis Aucoc (1850–1932) was one of the leading jewelers in Paris, and acquainted Lalique with the latest styles and techniques in jewelry. At the same time, the young man studied at the School of Decorative Arts in Paris, and subsequently at Sydenham College in London. Returning to France in 1880, Lalique was freelancing as a jewelry designer by 1881. In 1890, he established his own shop in Paris during a period when Japanese art and the Arts and Crafts movement helped develop the popular Art Nouveau style. Lalique’s inspiration in his jewelry was the natural world of the French countryside, as well as Japanese art that included natural motifs. Unlike other jewelry designers, he incorporated materials not usually used in jewelry, particularly the use of glass. He only used precious gemstones when they brought something to his pieces artistically, rather than for their value. His jewelry designs are truly works of art, not just settings for expensive gems. Many of the art forms developed in both Korea and Japan were indebted to Chinese influence, but both cultures made changes to traditional forms that made them unique to their cultures. 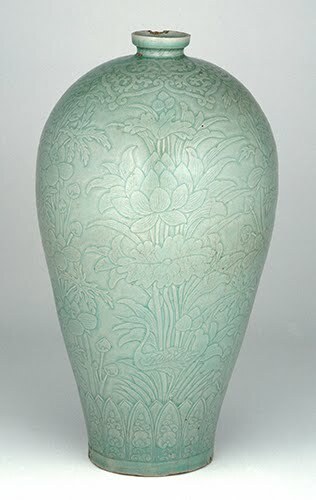 The maebyong vase is a Korean variation on the Chinese meiping (literally “plum vase”), a vessel originally intended to store wine or oil, and was later used to display plum blossom branches. Typical of the Korean form is the incised, rather than painted, decoration of cranes and lotus flowers. This vessel has the typical celadon glaze, a blue-green to gray-green hue, that was perfected during the Goryeo Kingdom (918–1392 CE). Koreans perfected celadon glazes after learning technological and kiln modifications from the Chinese. They had initially learned of the glaze from Song (960–1279/1280) Chinese artists, particularly from the Yue kilns. 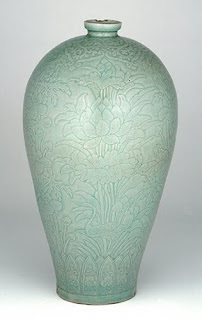 Early Korean celadon wares were undecorated in order to emphasize the importance of the nuances in the glaze’s color. By the 1100s, Korean artists explored many ways to decorate the vessels, relying most heavily on incised patterns and inlay. We have had several snowfalls in the past couple of weeks. On Presidents’ Day I found myself staring at a snow-laden tree across the street and thinking, that looks like a Japanese woodcut of a snow-laden tree. The whole process of multiple woodblock prints of the ukiyo-e period (ca. 1660s–1860s) was so complicated, I imagine snow scenes were just another one of those complications. 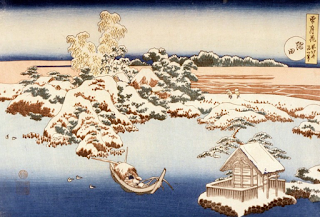 Below are three examples of the beautiful woodcut technique used by ukiyo-e block-cutters to create snow scenes from brush drawings by the artists. 1) The artist draws the composition for the print, and gives instructions to the printer for what colors go where. 2) The woodblock carver(s) cut different blocks each for one color as indicated by the artist. 3) Each block is printed, starting with the block bearing the contour lines of the composition. 4) The publisher inspects quality. The tedious process of producing prints from the artists’ drawings began with an outline drawing (sen-gaki) of all of the contour lines that established the major forms of the composition. This was traced from the artist’s original drawing using minogami paper that was thin enough to trace with. The resulting traced image was transferred to the woodblock and became the foundation block for the finished print called hanshita-e.
As each block was carved for from nine to twelve colors, they were aligned during printing along an L-shaped mark in the lower right corner of each separate sheet. Hokusai is undoubtedly responsible for the popularity that evolved for series of landscape prints. This was based on his series Thirty-Six Views of Mount Fuji, produced between 1826 and 1830. 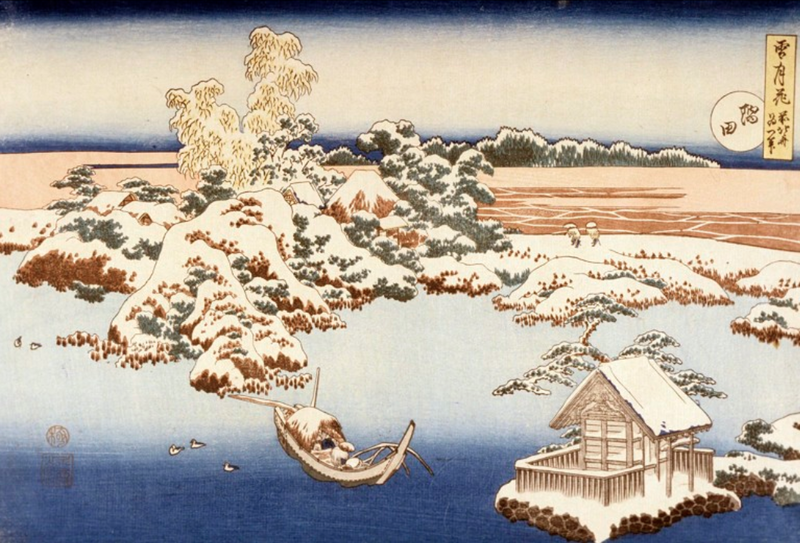 Hokusai explored the possibility of atmospheric snow scenes more than any previous ukiyo-e artists. His drawings would indicate which colors went where. I’m wondering if the woodblock carvers were relieved to do snow scenes that used the paper as the negative space? In Snow on the Sumida River, the introduction of Western chemical inks (aniline) gave the printers who inked the carved blocks extra steps to do. 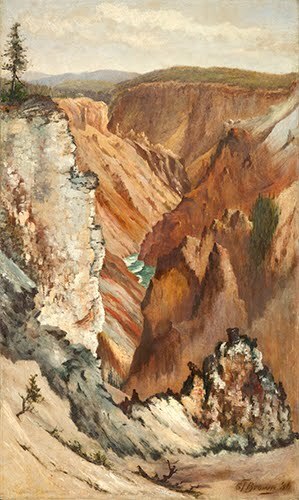 The artist would indicate where he wanted the colors in his original drawing, including areas that should be rubbed to give the effect of gradated color, seen in this print in the foreground water and background sky. 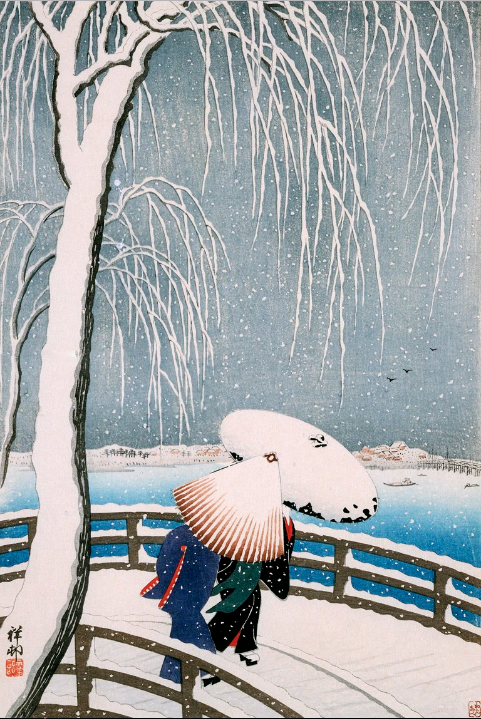 Of all the ukiyo-e artists who specialized in landscape prints, Hiroshige was undoubtedly responsible for refining the atmospheric snow scenes with which we are now so familiar. His directions to the block carvers established the practice of depicting falling snow by putting tiny gouges into the blocks printing the dark colors of the composition. This is clearly seen in Evening Snow on Asuka Mountain in the sky and also in the shading in the bottom of the print. 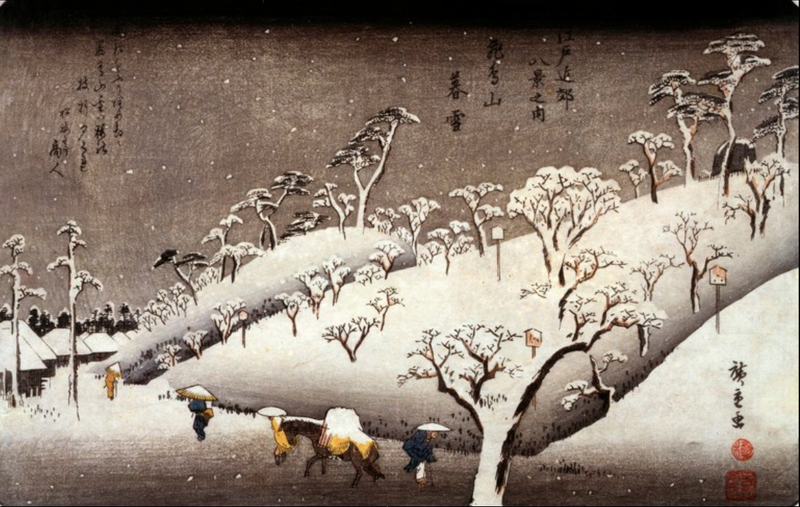 Hiroshige produced more than 1500 snow scenes during his career. When Hokusai’s Thirty-Six Views of Mount Fuji was published, Hiroshige was still producing prints of bijin-ga (beautiful women) and Kabuki actors. Inspired by the range of possibilities in landscape composition, he produced his first series Famous Places in the Eastern Capital in the early 1830s. The ukiyo-e style of prints of everyday life, beautiful women, actors, and landscapes waned in popularity as Japan rapidly westernized at the end of the 1800s. In the early 1900s, artists who reacted against the rapid industrialization of the country attempted a revival of the style in the shin hanga (new print) and sosaku hanga (artistic print) movements. Shin hanga copied the old hierarchy of artist-block carver-publisher, while sosaku hanga artists drew the composition, carved the blocks, and made the prints themselves. Ohara Koson is considered by many scholars to have been one of the foremost of the shin hanga artists. 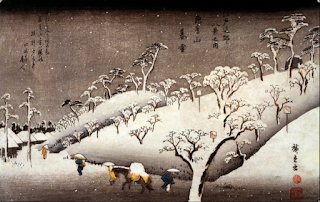 He certainly emulated beautifully the snow scenes of Hiroshige. 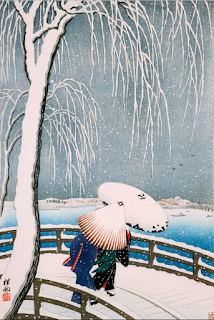 As you can see in Willow Bridge, he made sure that the artists indicated the falling snow by putting little gouges in the woodblocks carved for the colors of the sky, the water, the railings, and even the garments on the two pedestrians. 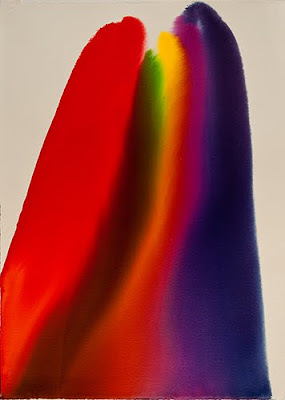 Some art historians, when discussing an artist’s work, will say “oh, but he’s (or she’s) a brilliant colorist!” I’ve never really known when to use that phrase with the proper cachet, but I would be wallowing in understatement if I used it in any description of the work of Paul Jenkins. This artist’s work is simply stunning. Now, I’m a big fan of Helen Frankenthaler’s (1928–2011) stain paintings because they are brilliant and quite often evoke landscape to me. But, Jenkins’ works starting in the late 1950s absolutely knock my socks off with their high-intensity color. I’m a big sucker for color, as you know, and Jenkins’ paintings are a celebration of pure color. 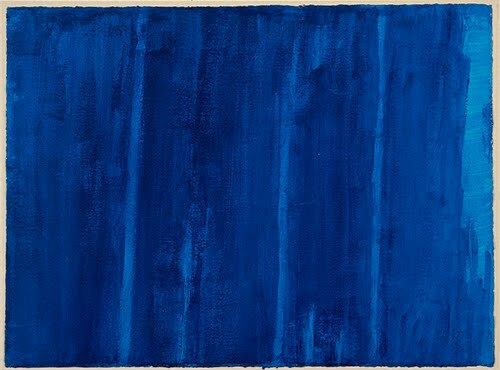 I think the only other Abstract Expressionists whose work excites me on this front are Mark Rothko (1903–1970)—before he started experimenting with black and brown—and Grace Hartigan (1922–2008). One of the main tenets of Abstract Expressionism was the artist expressing the inner self, with the finished painting a record of the process of that search. Most of the Abstract Expressionists were in sync with that philosophy and with the Jungian idea of the disconnect from the body while producing art. 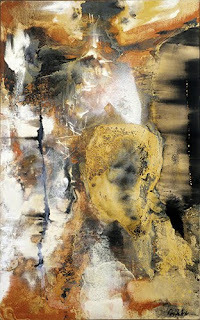 Jenkins is an interesting personality in the world of Abstract Expressionism. Like Mark Tobey (1890–1976), the fellow New York School artist he befriended, Jenkins’ work was inspired by more than Jungian philosophy and the Surrealist-inspired emphasis on subconscious creation. The reliance on spontaneity of Zen Buddhist meditation, the theories about constant internal change of I Ching philosophy, and the reflective abstract imagery in Symbolist painters such as Odilon Redon (1840–1916) had major impact on Jenkins work since early in his career. From early on, as well, Jenkins experimented with different methods for spreading his paint into the jewel-like color and semi-transparent veils of paint that are his signature style. He rarely, if ever, used a brush to spread paint. Most often, he used knife-related tools, including his favorite ivory-handled knife. Fascinated with the stain paintings of Frankenthaler and Morris Louis (1912–1962), Jenkins devised his own method of pooling, rolling, and flowing paint on the canvas with a control that allowed the pure intensity of the colors to shine through. He often dripped thin lines of white paint to set off colors. As early as 1958, he called himself an “abstract phenomenist,” indicating that his work reflected god inside of him. From that year on, he titled most of his works Phenomena, searching for ways to express ideas rather than forms that people would subsequently search for in his works. His use of more luminous colors began in the early 1960s. When looking back at his work, one marvels how he created luminous compositions in a variety of pigments (oil, acrylic, watercolor) as well as lithography. Jenkins was born in Kansas City, Missouri, and spent some of his childhood in Youngstown, Ohio. Although he met both Thomas Hart Benton (1889–1975) and Frank Lloyd Wright (1867–1959) as a young person, they did not impact his art. Wright even suggested that Jenkins take up farming. After service in World War II (1939–1945), he moved to New York in 1948 and studied at the Art Students League. In New York, during that germinal moment in American modernism history, Jenkins befriended Jackson Pollock (1912–1956), thrilled by the dynamism of his painting, and Mark Rothko (1903–1970), whose brilliant colors appealed to him. With all of the influences that Jenkins encountered, he developed a distinct abstract style that has stood the test of time in luminosity and brilliant appreciation of pure color. I have to admit, I prefer his palette after 1958 to this early one, though the way he spread the oil paint is very exciting. The work below is a simply stunning piece, if not only for the brilliant color (especially my favorite, the violets), but for the scale. Can you imagine controlling the free-flowing on paint such a large canvas? !